Government psychologists, sociologists and advisers should be fired for not offering their expertise to government in preventing this hugely embarrassing situation. The DSS too, has had it’s fair share of legal blunders, inch by inch, handing the second Nnamdi a legal initiative, even in incarceration. Nnamdi’s lawyers appear to be smarter than the prosecution. How it plays out is certainly a subject of interest. Here I tell a tale of two Nnamdis, who have blazed a trail across our country, Nigeria. The first Nnamdi was a politician and a journalist, educated in the United States of America, whereas the second Nnamdi is an activist, economist and educated in the United Kingdom. The first irony is that both, with entirely different educational traditions from two countries across the pond, cross paths in terms of activism. The second irony is that an economist, who by all expectations should tend to be pessimist and conservative in nature, and especially coming from a conservative nation like Britain, would pick up a cause as contentious as Biafra, and project it to such intense levels of world attention. While the activism of the first Nnamdi was to free the whole of Nigeria from the shackles of colonialism, the second Nnamdi is fiercely acting to free the Eastern Nigeria from the clutches of a “local cabal” who he claims work only for the interest of the select few. The first Nnamdi was a pan-Africanist, but the second Nnamdi is a regionalist, with Zionist credentials. The first Nnamdi had opportunity, before independence, to pull Eastern Nigeria out of the British construction called Nigeria, because regions were greatly autonomous and had any region, at the imminence of independence, manifestly expressed the desire to be independent of the rest of Nigeria, the British had no scruples, but to grant such expressions of self-determination. The first Nnamdi had no such inclinations, for he sought Marcus Garvey’s utopia of pan-Africanism, alongside such proponents as Kwameh Nkrumah. Then was a golden era of idealism, pregnant with possibilities, and imaginations of greatness running wild. Then our educated elites could rub shoulders with the greats of developed nations, for in reality, they had been acculturated, groomed and drilled in the rigours of intercultural communication, etiquette, and diplomatic finesse. Little wonder their diction then was so close to that of the English natives, that they had no sense of insecurity, foreboding, or inhibitions. Such was their confidence, that the first Nnamdi did not foresee any issues about his region competing shoulder to shoulder with any other region and even countries. The second Nnamdi has no such illusions. He has the benefit of hindsight. He had seen how the Eastern region’s aggressive competitiveness at intellectual, economic, political and social fronts backlashed and led to much discontent, and utterances on YouTube from prominent men of that era about such “bad belle” abound. He had seen how the diversity of Nigeria had become a perpetual burden to national development, and had come to a conclusion that it’s hopeless to try. The diverse peoples should go their different ways, he has surmised. More to his chagrin, he has read and heard and watched clips and images of Biafra, the decimation, deprivation, and destitution of a people, although resilient and industrious, yet continue to struggle against a system set up to contain them. He has had enough. He also has seen first-hand, that our elites today, are nowhere a near match to the profound education of mind, body and spirit that the early elites had. He had seen the degeneration of values, education, religion and the sharpened base and primitive instincts of our elites. Even as the rest of the world are moving and advancing, we appear to retrogress on all fronts and across all parameters. The first Nnamdi was a pacifist. He was also a lucky man who had an ardent and fanatical followership across Nigeria, especially in the Eastern region. He was much loved across Nigeria, but people never really rose to his full appreciation, for exactly the same reasons why the second Nnamdi is fighting for the excision of Eastern Nigeria. The first Nnamdi could have died on January, 15th, 1966, but for a dint of pure luck, he was outside the country. Some say he was tipped off by his cousin, others say the coup was fast-tracked to counter another impending coup. Whatever the case, some analysts say, had the first Nnamdi died in that coup, his death could have spared thousands of his kinsmen who died in the pogroms in the North and subsequently, millions who died in the Biafra war, the ordeal and prospects of extermination. The second Nnamdi appears ready to die, unlike the first Nnamdi, but the problem is that his death would surely ignite a cataclysm that might eventually achieve his dream of dismembering Nigeria. I don’t know if the federal authorities realise this. The Biafra idea is to the second Nnamdi, what “one Nigeria” was to the first Nnamdi. Both had passion for their different obsessions. The first Nnamdi called Nigeria “his beloved country” but the second Nnamdi calls it “a zoo”. The first Nnamdi was half-hearted about Biafra, and although acting as a diplomatic emissary in the early days of the war, defected to the federal side when it was crimson clear it was a futile war. The second Nnamdi is leading from the front and is also not backing down from his claims so far. The second Nnamdi appears to have very logical and coherent reasons for his convictions, and it is fair to say, a man is entitled to his convictions, regardless of what others think of his claims. Listening to the second Nnamdi, you get a sense he has lived and breathed these ideas from his youth. He marshals them out with dexterity and practiced fluency. The Biafra idea is to the second Nnamdi, what “one Nigeria” was to the first Nnamdi. Both had passion for their different obsessions. The first Nnamdi called Nigeria “his beloved country” but the second Nnamdi calls it “a zoo”. The first Nnamdi had is fair share of arrests and court cases, first in the Gold Coast, now Ghana, and subsequently at the hands of the British colonialists and later during an investigation in post-independent Nigeria. 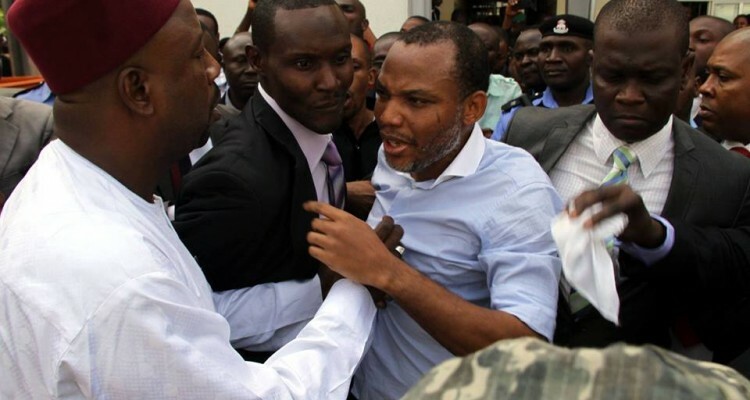 The second Nnamdi is already having the battle of his life in a series of court-cases and appearances that continue to heat up the Nigerian polity. The first Nnamdi was seen as a threat, due to his towering stature, acumen, enterprise, skills and foresight. He was a self-made man. His fame came from hard work, resilience and years of commitment. The second Nnamdi has been seen as a threat even in obscurity and thus has just been made famous by the state. His singular arrest has provided him leverage and ensured his international status. From now onwards, anything happening to the second Nnamdi, is sure to grace newspaper and social media pages both traditional and emergent. One pundit, Bishop Hassan Kukah has forcefully argued that no political leader in Nigeria can muster the crowd this “boy” has been pulling, even from behind bars. He therefore asked the government to do business with him. The first Nnamdi was a crowd puller too. He could not be ignored in the Nigeria of his days. He was and still remains the singular Igbo leader of modern times yet to cross ethnic and tribal divides. Ojukwu was not seen as such and could not be accepted by other tribes. This second Nnamdi appears to be making headway towards acceptability, despite his fiery rhetoric, thanks to the federal government. The second Nnamdi saw demonstrations in all the South-Eastern and most South-South states, and then in Lagos and Abuja. Across the world too, in many countries, there have been protests calling for his release. There might be other sympathisers in unexpected places waiting to erupt into protests at the snap of a finger, who knows. The growing discontent, both economic and social, has further served to fuel antipathy and is driving youths to this second Nnamdi, despite the divisive posture of his rhetoric. Government psychologists, sociologists and advisers should be fired for not offering their expertise to government in preventing this hugely embarrassing situation. The DSS too, has had it’s fair share of legal blunders, inch by inch, handing the second Nnamdi a legal initiative, even in incarceration. Nnamdi’s lawyers appear to be smarter than the prosecution. How it plays out is certainly a subject of interest. Prince Chigbundu is a social commentator. He lives and works in Abuja, Nigeria.